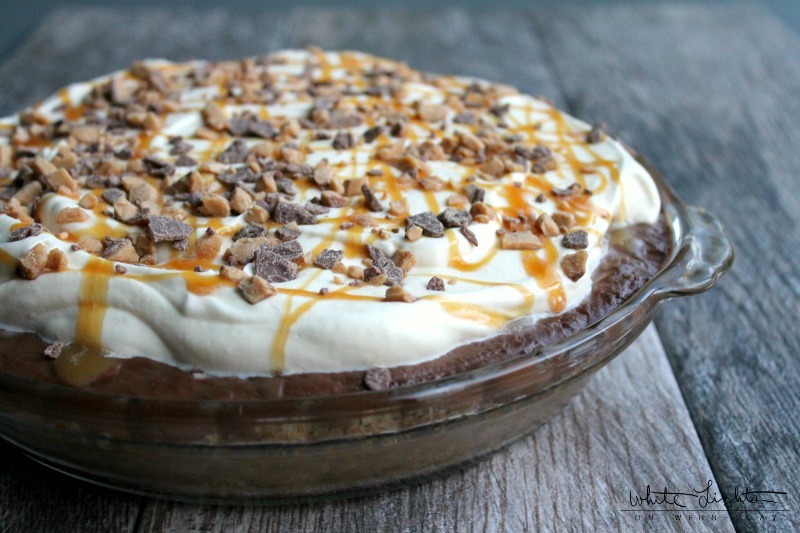 Caramel Toffee Crunch Chocolate Pie is a decedent pie perfect for the holidays! The holidays are my favorite time of year. Once Halloween is over I go into full on baking mode. I just can’t help myself. Now that our boys are getting older, they’re almost always with me in the kitchen asking to help with anything I’m making. I love that they’re joining in and that we’re starting our own #NewTraditions! 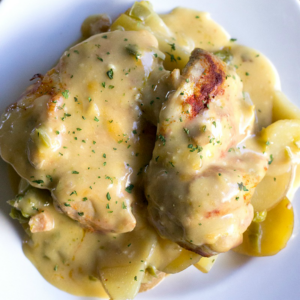 I have fond memories of cooking with my mom and grandma growing up and know my boys will too. My favorite kitchen helpers.! 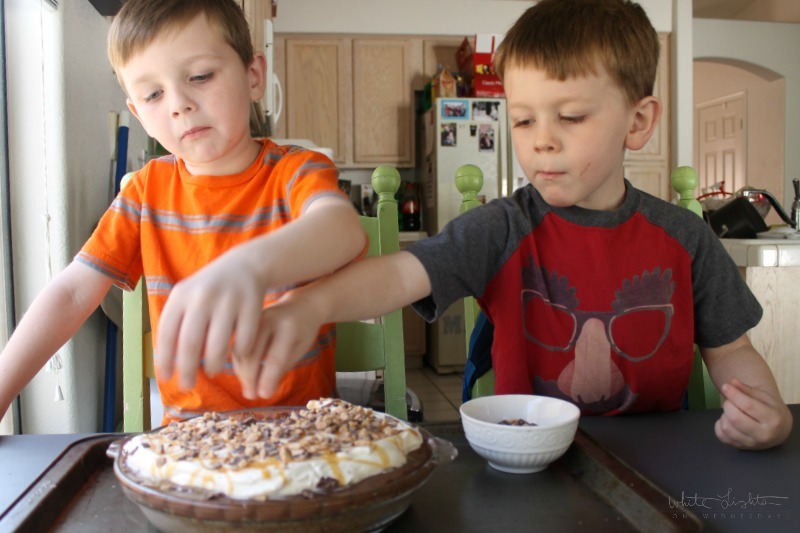 While putting the Heath Milk chocolate Toffee Bits on top of the pie was their favorite part, because you know…quality control, I had the boys help me with all different parts of the recipe. Otto reads what we need to add next and how much. They both scoop and measure ingredients while Eddie counts what we add, and they both get to stir. Stirring’s the best! This year, I wanted to make a pie that the boys would love. 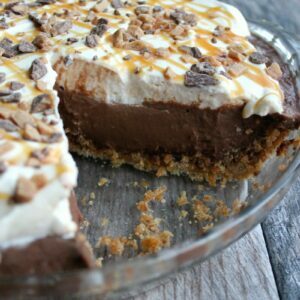 Heath is Mike’s favorite and the boys love anything chocolate, so this pie is basically dessert bliss in our house. I love using Hershey’s products for baking. Their chocolate is my absolute favorite! It’s so darn creamy! There used to be a standing tradition that any boy coming our house for me or my sister would have to bring Dad a Hershey’s Milk Chocolate bar. I’m not kidding. But now with the full Hershey’s baking line, I can grab the kids a dream up all kinds of fun desserts for us to make and keeping holiday baking tradition going. The boys gobbled up this pie. I can’t wait to make cookies with them next. I’m notorious for Christmas cookie plates. I hope you’ll grab the family and make this pie to start your own new traditions! Want some more inspiration? 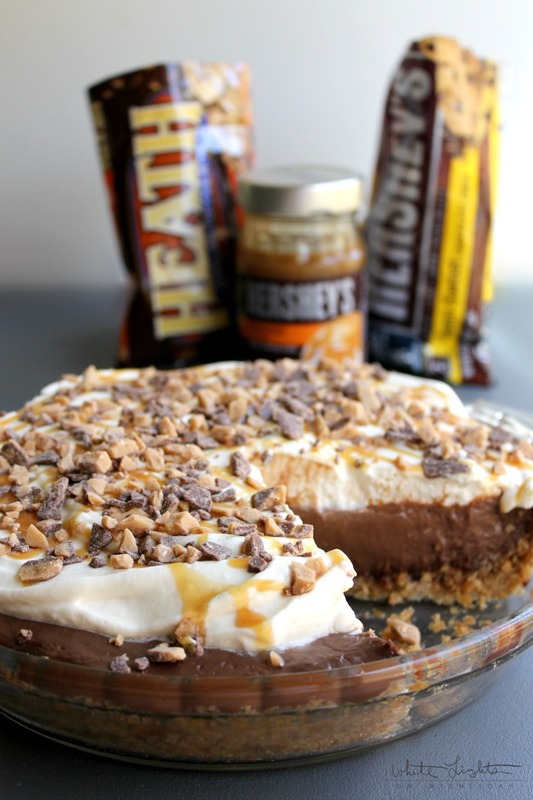 Check out some of the delicious recipes from The Hershey Company and get baking! 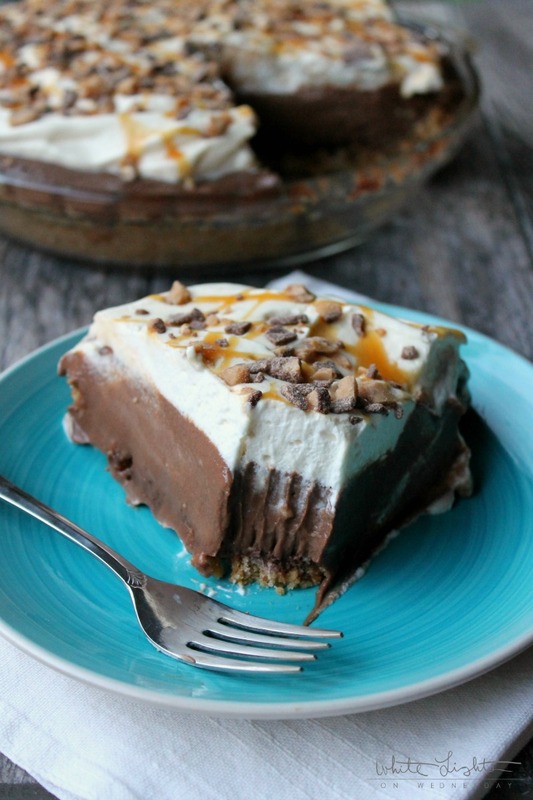 Caramel Toffee Crunch Chocolate Pie is a decadent pie perfect for the holidays! In a medium mixing bowl, combine the graham cracker crumbs, sugar, and salt. Pour in the melted butter and stir until everything is evenly moistened. Pour the graham cracker crumbs into a 9-inch pie plate. Use your hand to spread the crumbs out evenly in the dish. Press the crumbs down, packing them into the pie plate, starting with the bottom first and then working your way up the sides. Bake for 7 to 8 minutes. Remove from the oven and cool completely. In a medium to large saucepan, whisk together the milk, half-and-half, and egg yolks. In a small mixing bowl, combine the sugar, cornstarch, and salt. Place the saucepan over medium-high heat and whisk the sugar mixture into the milk mixture. Cook for 6 to 9 minutes, whisking frequently, until the mixture bubbles and thickens to a pudding-like consistency. Remove the pan from the heat and whisk in the butter and vanilla. Add the chocolate chips and whisk until the chocolate has melted completely. 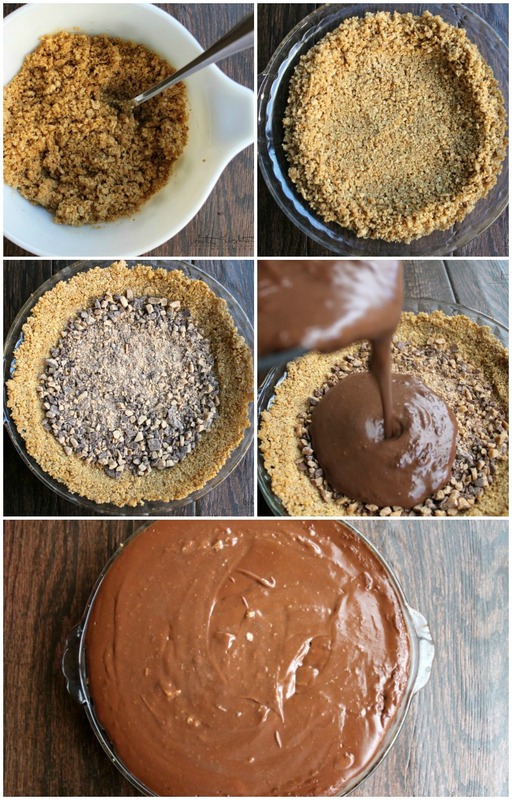 Pour the Heath Milk Chocolate Toffee Bits into the bottom of your cooled pie crust, and spread into an even layer. Pour the chocolate pie filling onto of the Heath Milk Chocolate Toffee Bits. Cover the pie filling with plastic wrap, placing the wrap directly onto the filling. Chill for 2-3 hours or until the filling has cooled completely and set up. In a large mixing bowl, beat together the heavy cream and powdered sugar until the cream begins to thicken. Add the Hershey’s Caramel Topping and continue to whisk until medium peaks form. Drizzle Hershey’s Caramel Topping over the whipped cream. Sprinkle with Heath Milk Chocolate Toffee Bits. Thank you so much Roxana! 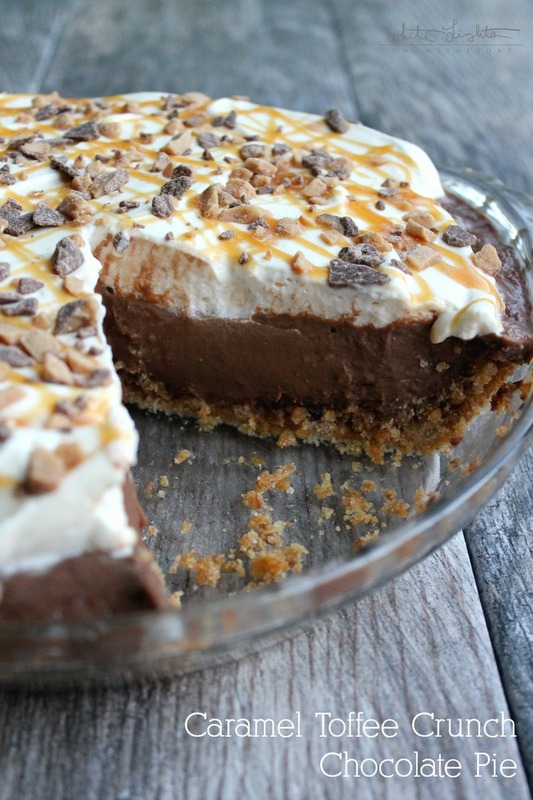 I love chocolate cream pie, but the Heath bits and caramel really take this pie over the top in the best possible way! My husband was fighting our friend off for it. Haha. I have a question about FREEZING this pie. 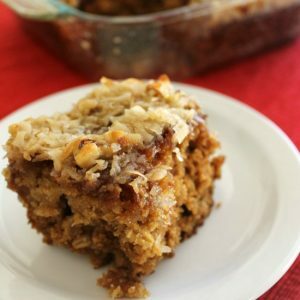 I’d like to make it now, freeze it, and then, place in fridge to thaw on Thanksgiving Eve (to serve after turkey, of course!) Will it freeze all right? Thanks so much! Hi Mary! 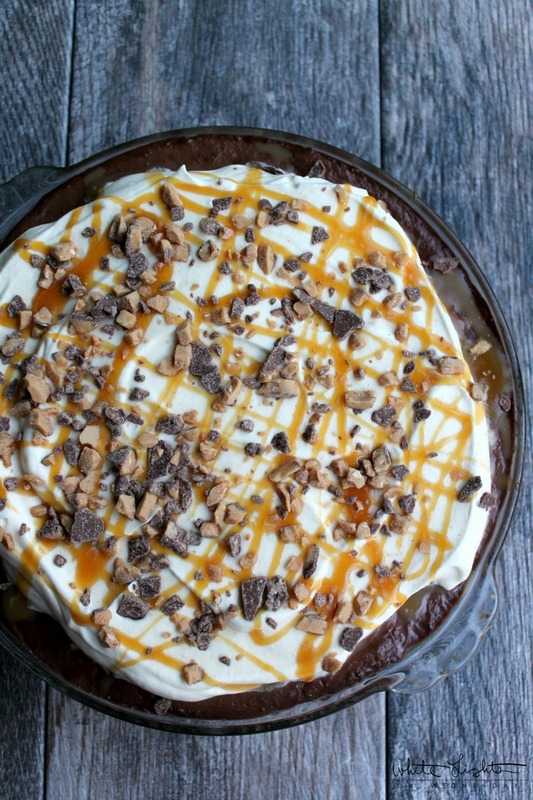 I’ve never frozen this pie, but you could give it a try. I would make the crust and filling, cover in plastic wrap & foil, and freeze at that point. Then top with whipped cream and all the toppings after it thaws. Or you could use Cool Whip if you want to freeze it all at once. I’d love to know how things work out if you try it. I love toffee! 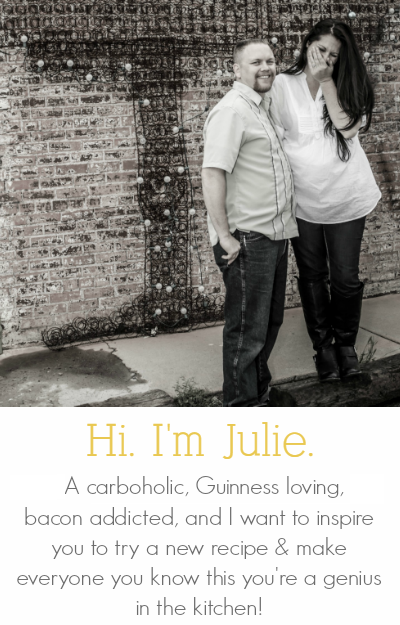 This pie looks so yummy, Julie!!! And the pics look gorgeous!!! Love them both! I want to make this pie for sure! did you use a regular pie plate or deep dish? I used a regular 9-inch glass pie plate. This pie looks amazing! 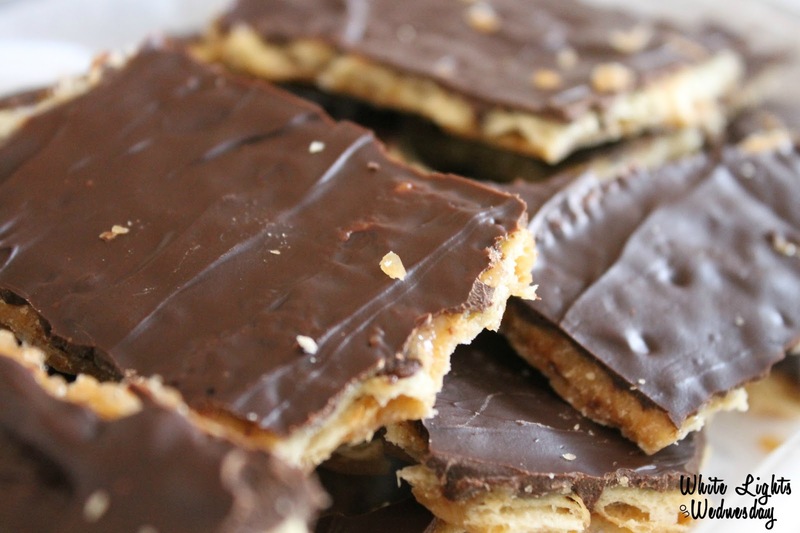 Do the toffee bits you placed in the bottom remain crunchy, or do they become soft or dissolve? Hi Rhonda! They stay crunchy for me, but we usually get to this pie within 24 hours. Longer than that they may start to break down.